Well Alison has had a pretty good day today. We celebrated eight years of marriage today with eight hot pink roses (same as our wedding) some nice cards and some really good cuddle time tonight. All things considered, it's been a great day. She had a full day of therapy and our pastors stopped by for a visit this afternoon. We've been pretty excited the past couple weeks because Alison really has begun to show a good amount of new movement. Not only does she still have really good movement in her left leg/foot, she's recently shown signs of life in her right foot, left hand, left shoulder and head/neck muscles. Now most of these are subtle, but they're not involuntary and they weren't happening before. All that said, we're pretty excited about what's to come. Thanks for following along, praying and supporting us in so many ways. the ever slight nevertheless magnificent movement in her hand brings tears to my eyes every time I see her do it! 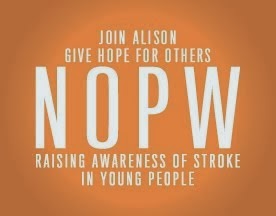 she is such an inspiration to me...Alison has changed my life forever! I thank God every day she found her way into my life!